Single story beauty located on quiet cul de sac in Valley Center's Silver Oaks estates.Fully fenced & gated w 2.1 very usable acres, a WELL + 3000 gal storage tank to water your landscape.Meticulously maintained & move in ready.Light, bright,easy maintenance floor plan.Kitchen opens to family room.Plantation shutters.Spacious secluded gazebo to relax under w peaceful park like views.Suitable for horses & plenty of room for RV parking, or to build stables, workshop or barn.Close to High School. Two homes for the price of one! Come see the architechts own dream home, horse property and 1400 sf guest house! 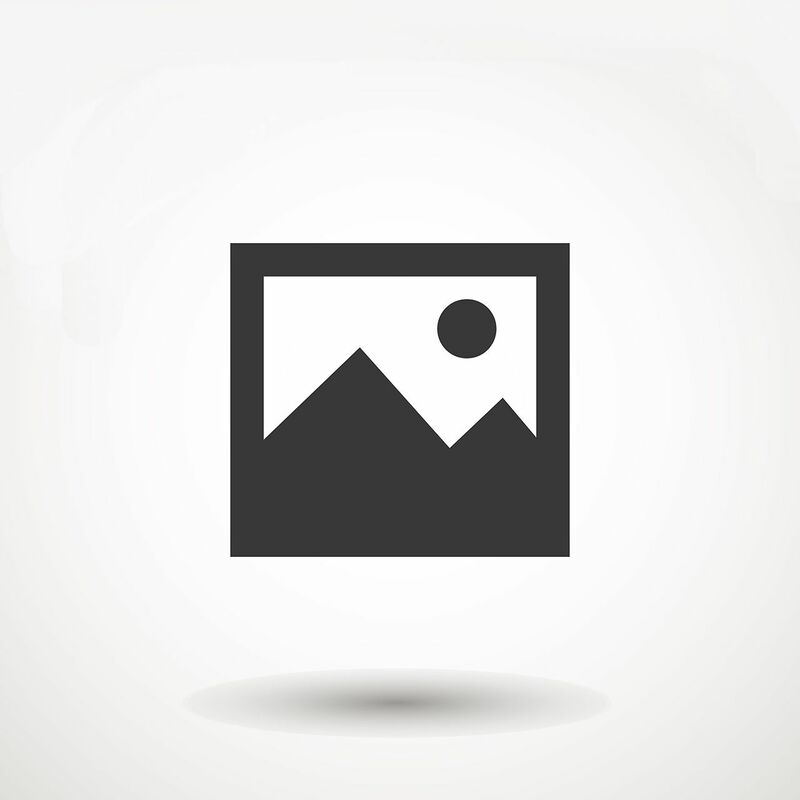 (Rental income up to $1900 per mo!) See the original blueprints. 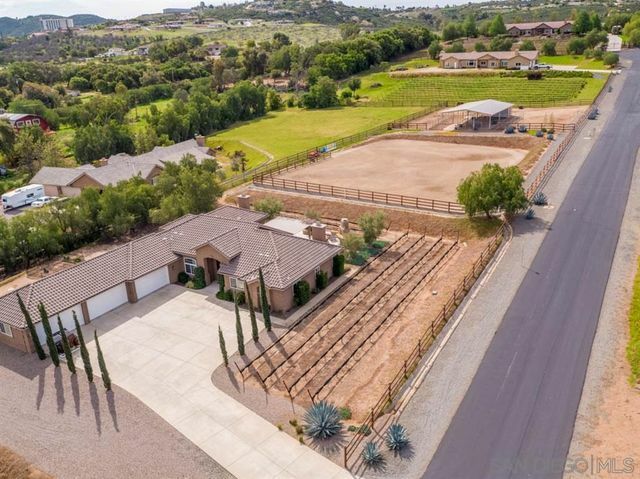 This horse property is in turn-key condition and sits on 2.4 completely fenced acres. It is served by a new 14.070 KW-42 panel Solar System, owned and large enough to completely power both houses pool/spa and an electric car. No CCR's, Mella Roos or electric bill! The guest home is perfect for extended family or rental income! Lowest price per square foot available! 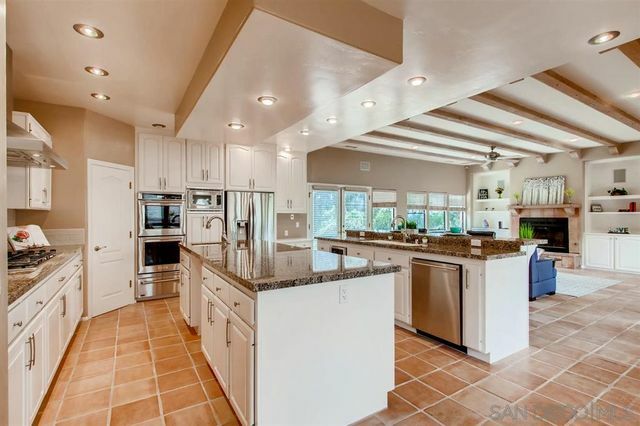 This beautiful upgraded home is one not to miss! Sit on the custom back patio or on the lawn to watch the sunsets go down. The home has an amazing layout with 3 bedrooms, 2 full baths, and 2 living rooms! There is a two car garage to park your vehicles in or to work out of. There is also a two car tandem parking area next to the house. The community is quiet, exceptionally kept, and fun! Lot fee includes unlimited use of golf course is included in HOA dues. 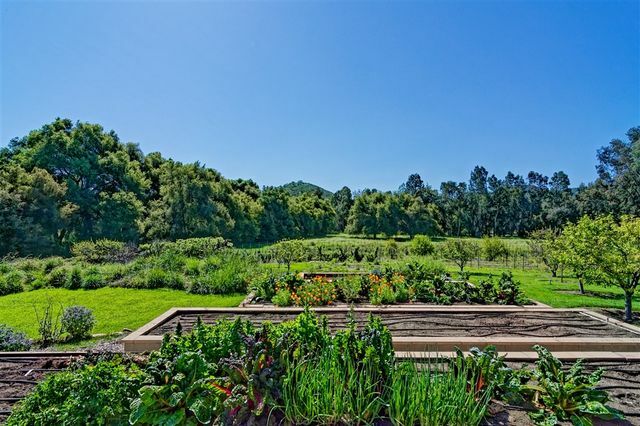 10 acre farm with the charm of an old west homestead. 2 bedroom home with 2 baths a covered patio, pool, guest house and large work shop. The work shop has a covered parking area large enough for a motor home and a boat. A well provides irrigation for the farm and a water connection to VCMWD serves the residence and work shop. The property has 30 plus oak trees and level ares for corrals or grazing pastures. The owner has planted several fruit trees, raspberries and built raised growing beds. 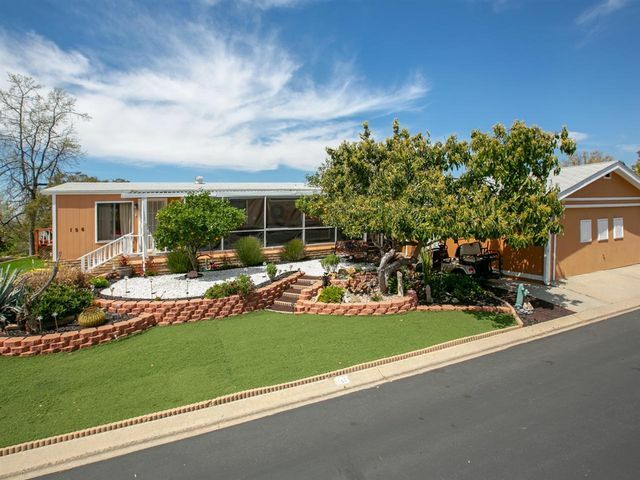 Outstanding panoramic views to Palomar Mountain from this awesome lot. Build your dream home with infinity pool and entertaining area. Country living yet very close to all shopping and restaurants. Electric and water in the road. This lot is ready for your custom estate home. Dream Big! LIVE! VACATION! ENTERTAIN! Who says you cant have it all? Former Model in Exclusive Gated Community. Grand two story entry featuring Formal LR and DR, Great room and breakfast area. Chef's Kitchen has SS appliances, double ovens, walk in pantry and Lg center island. 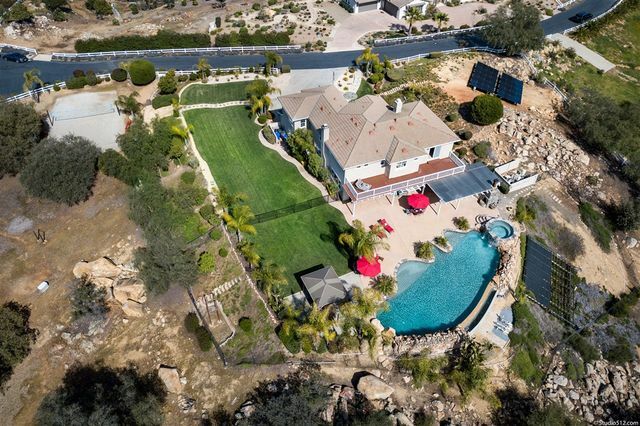 It's about the California lifestyle 22 Yard Vanishing Edge Pool/Spa/Water features, 40 Solar Panels, extensive landscape rock, Sand Volleyball, Complete Summer Kitchen & Tree House over 2 Acres + RV Parking and VIEWS VIEWS Bring your Horses! Unbelievable value in Ridge Ranch Estates just 15min from hwy15! APPRAISED at $1,125,000! 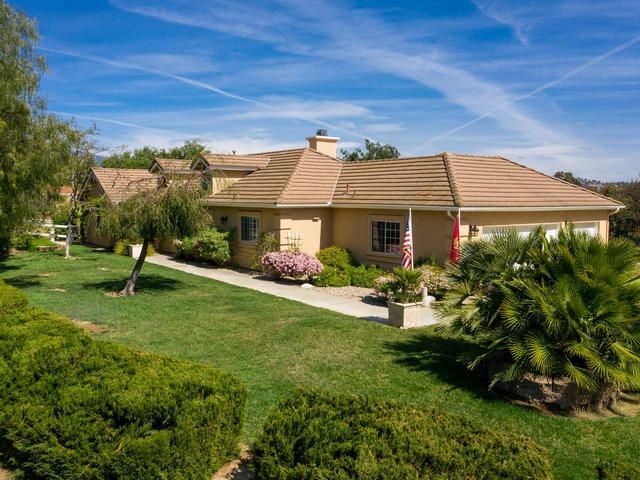 4,600+sf, single story hacienda w/panoramic views from Big Bear to Palomar Mtn. Desirable courtyard layout w/solid wood french doors & large windows that fill the interior w/natural light & fresh breezes. 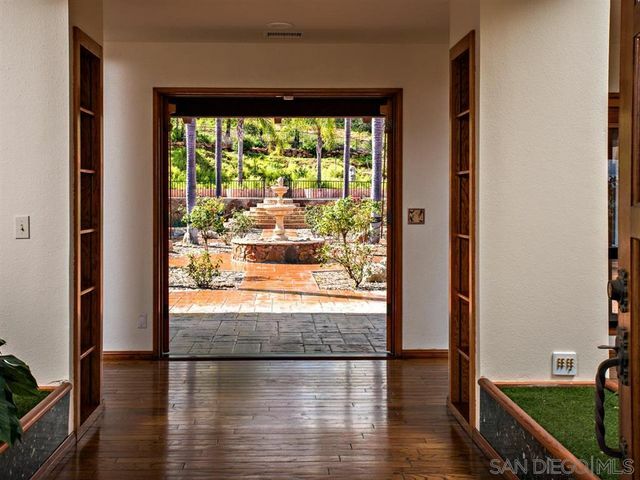 High ceilings, refinished wood floors, extra wide halls, custom pool, outdoor shower, bbq, fireplace, putting green & drought tolerant landscaping. 5 car, full HVAC garage & converted, attached granny flat.